What is up with this weather here in Utah? One week we have snow and the next it is over 100 degrees. Actually I don’t mind it at all. The changing of the seasons is always spectacular and the yard is actually coming together nicely. We planted flowers and vegetables and mowed and weeded. The best part of the summer kick off was making a fire in the fire pit and roasting hot dogs. Summer is upon us and camping and four wheeling is just around the corner. 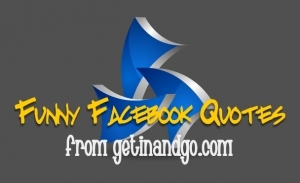 Before starting on your next journey, enjoy this week’s Funny Facebook Quotes. Police Scanner just reported a drunk naked idiot wearing snow boots, singing free bird, riding a lawn mower down the highway! Ok Girl Just Where the @%*$ R U GOING? Most people would tell you to knock it off and grow up, me I say “ok where are my snow boots and riding lawn mower cause I wanna join ya! Now that’s what real friends do! Thank goodness for fake fingernails!! I just cut my finger so bad, and if it wasn’t for my nail I am pretty sure I would of cut the whole thing off!! I get moron of the year award!! Well my husband called to tell me he bought me a rifle (243), but its mine to shoot elk with. But his to shoot all the other times… lol doesn’t that mean its his rifle i will just be borrowing it for elk hunt. Ha ha ha!! Right now in the Astronomy merit badge class at Scout camp. Try saying “Uranus” to twenty 12 and 13 year olds and see what happens. is watching some freak movie on Lifetime where a mother is about to murder her baby b/c she thinks it is possessed….This is why I only watch CNN…. comment: Don’t you think it’s actually scarier to have to watch CNN that Lifetime movie becomes a true story! Those Lifetime movies always are creepy…did you know some of them are actually true based! How about we disregard both Lifetime and CNN? Will someone please tell me why I had to drag my kids out of bed at 7 a.m. for school and now that school is out I can’t keep them in bed til 7?? They’re killing me. Hello, I found your blog in a new directory of blogs. I don’t know how your blog came up, must have been a typo. Your blog looks good, have a nice day.